Major hot tub and swim spa brand specialists marked the historic ‘coming of age’ 21st anniversary edition of SPATEX in Coventry by promoting a bumper crop of new product launches for the thriving British market. Along with many familiar loyal SPATEX supporters from the pool industry a large contingent from the hot tub and swim spa market had swelled the ranks of exhibitors and provided a wide range of wet leisure products for visitors to view as they browsed round the stands in the Ericsson Exhibition Hall of the Ricoh Arena. The success of the previous three editions in the West Midlands have been matched by booming consumer demand in the wet leisure market that manufacturers and their distributors have been keen to capitalise on with increased production of new models and enhancements for dealers to promote this year. Ahead of the 21st edition, SPATEX organisers and exhibitors had pulled out all the stops to ensure the fourth outing in Coventry once again provided a perfect platform for over 100 exhibitors to promote their new products to help hot tub retailers and their wet leisure counterparts increase their showroom provisions. This helped to attract good levels of footfall around the stands after generating 1,360 confirmed unique visitors. Loyal SPATEX supporter Certikin International had three dedicated display areas, including Calorex and CertiDos product promotion on their respective stands, to showcase its wide range of products for the hot tub and pool markets.There was also the chance for visitors to enter a special prize draw with the opportunity to win the first prize of five-night stay for two in Cape Town, South Africa and a second prize of a European city break by purchasing a complete Roldeck system. On its main stand was the wet leisure powerhouse was proudly displaying its 2016 Caldera Spas International Dealer Award trophy alongside the new-look Utopia Series Cantabria from the Caldera Spas hot tub range by USA hot tub giant Watkins Wellness. “We’ve had a very good response to the stunning new Cantabria and I can report that we are attracting more dealers to our Caldera Spas network,” said Certikin Marketing Manager Cath Saunders. 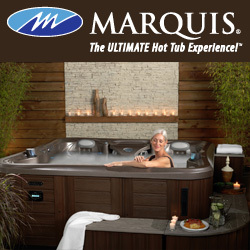 A number of companies had booked a double stand presence including the Aqua Warehouse Group that distributes L.A Spas and Vita Spa hot tubs and swim spas manufactured in the USA by MAAX Spas. The booming distributor had a dedicated stand to promote the innovative Covana covers range; with working displays of the Covana Oasis and Evolution designs helping to attract trade visitors to the stand throughout the three days of the exhibition. “The decision to promote the Covana covers has paid off and we’ve had a lot of interest on our stand,” said Vita Spa Dealer Manager Graham Message. To capitalise on the growing demand for wet leisure product accessories a separate stand had also been booked by Aqua Warehouse Group to promote its flourishing Aqua Spa Supplies division, which that was highlighting the Spa Marvel water treatment and the flourishing ‘Aqua’ range that incorporates Aqua Lift 3, and hand towel rails. “Our Aqua range is doing extremely well at the moment and we’ve had a good response from visitors to our stand,” said John Mabey. A number of exhibitors from last year had requested larger stand space this time round. Among these flourishing companies were Coast Spas UK, which was highlighting a raft of new model options from the thriving Canadian manufacturer, which is celebrating its 20th anniversary with a bumper crop of enhancements including the newly developed non-float lounger design that has been incorporated in the Element and Apex hot tub models. Two years ago Coast Spas unveiled the world’s first and only portable Infinity Edge Swim Spa and has now followed it up with the launch of the next model in this stable in the form of the new 17ft Infinity Edge Ultra model that was also been promoted along with the new Wellness II Party Spa, which has been designed with benching down each side of the tub to maximise space. Many exhibitors who had made their debut at the 20th edition had also signed up to make a return to SPATEX and Wellis distributor and Superior Spas chief Rob Carlin made his second appearance as an exhibitor to promote the latest models from the Hungary-based manufacturer, which is currently swelling its dealer ranks in the UK. Rob was delighted with the impact of the Wellis and Superior Spas promotion and the introduction of new StarLine spas options including the innovative Volcano stainless steel model, two-lounger Explorer and unique five-recliner design Voyager model. “We’ve had a great response to our new models and there has been increased interest from prospective dealers,” said Rob. Spanish manufacturer Aquavia Spa is another European manufacturer that is aiming to grow its British market share and was highlighting an expanded range of hot tubs and swim spas to cater for the demand from discerning customers who require unique and quality products for their home. As the latest evolution of the innovative all-seater Cube design, which achieved WhatSpa? Best Buy status in 2014, the Cube Ergo was officially launched to the British market during SPATEX and representatives for the Spanish company were keen to promote a new Fitness Spa swim spa model. “We are committed to continual growth and increasing our presence in the British market with the highest levels of quality, design and performance in our products,” said Aquavia Spa Sales Area Manager for the UK Sonia Guix. Staunch SPATEX loyalist Spa Crest Europe; with its Tuff Spas and Premium Leisure swim spas distributor status; was promoting new options from USA manufacturer Spa Crest including the Queen S100 hot tub and a special Spa Crest model for own branding purposes and the new Tuff Top cover for the round Tuff Spas TT350 model. Former BSPF President Issy Rickards Sanger and her husband Kevin of Elite Spas were promoting a new collaboration for the Arizona-manufactured Zen hot tubs and once again highlighting their association with the Alps Q Series models and St Louis-based Aspen Spas after introducing a new Joy hot tub model and Trojan swim spa option and Elite Party Pool model for their dealer network at last year’s exhibition. This time round they were highlighting the introduction of a new Splash swim spa model. “Our Party Pool has done really well in the past year and we’ve now got a Splash design option for our dealers and we’ve also introduced the Zen options to our range,” said Kevin. Long-running loyal SPATEX exhibitor Golden Coast also had a double stand presence and were promoting a host of new products for its Essentials collection of spa and hot tub accessories including the Ultralift range of cover lifters and highlighting its new distributor status for the Waterway’s spa steps, which can handle up to 800lbs per step; as well as the new Spectravision Adagio PRO LED lighting range. SCP Spa Product Manager Paul Thomas was on hand to highlight hot tub dealership opportunities and revealed that Beachcomber, which has launched a new Beachcomber Titanium 725 Special Anniversary Edition hot tub, had performed well in the British market in the past 12 months. “Our Beachcomber sales have outperformed our other brands and have been excellent during the past year,” said Paul. Experienced hot tub and swim spa distributor Catalina Spas Ltd was promoting the new name of Aqua Design & Leisure to ring fence wet leisure market activities and the latest options from the USA manufacturers of the new models in the Catalina Spas, Dream Maker Spas and Clearwater Spas stables. Catalina Spas Ltd Managing Director Stephen Crabb, who is celebrating the 20th anniversary of his family-run distribution outfit being associated with the USA hot tub and swim spa brand, is among a small contingent of distributors who exhibited at SPATEX in the last century during the late 1990’s. “A Monterey model that we intalled for one of our very first customers 20 years ago is still going strong,” said Stephen. Award-winning Marquis and Vita Spa hot tub and swim spa retailer and 1 Stop Spas chief Chris Brady had booked a stand to promote his fledgling distribution deal for DryCase products and SteelCore Security Straps for hot tubs and swim spas and his new SpaTech Training scheme. Chris reported that he was delighted with the response to the scheme, which is helping to raise the professional bar within the British hot tub market as an APSP Approved Training Provider and in association with BISHTA. “We’ve been very busy providing details about the SpaTech Training and we’ve had a really good response from the trade,” said Chris. During a successive appearance at the exhibition, Passion Spas were promoting enhancements to its levitation bed design and revamped models for its Chinese-manufactured Signature, Exclusive, and Sport Collection hot tub ranges. On display was the Ecstatic model featuring an enhanced version of the brand’s levitation bed; and also the next generation model of the best-selling Relax, which has been redesigned to build on the hot tub’s popularity over the past decade. “The Relax is one of our most popular entry-level models and we’ve relaunched it with a complete redesign so that the seating is much more supportive and comfortable,” said Arno Nieland. SPATEX organiser Michele Bridle revealed that she was delighted with the success of the 21st edition of the exhibition of which she has been involved with for most of its run in Brighton and the transition to Coventry. Michele also reported that the new midweek schedule had been well received and so it will be repeated again next year for the 22nd edition, which is schedule to be hosted at the Ricoh Arena once again from January 30, to February 1. “Early feedback from exhibitors has been very positive,” said Michele. “We’re delighted that all of our hard work has paid off and the mid-week schedule has been well received. “I’m so immensely proud of SPATEX. I have seen it grow from strength-to-strength over the past 17 years. To make a stand booking for the 22nd edition of SPATEX, running from Tuesday, January 30, to Thursday, February 1, contact the SPATEX team via email: helen@spatex.co.uk or michele@spatex.co.uk or telephone directly on: +44 (0) 1264 358558.